"Beginning with the Reagan administration through the Clinton presidency, federal leadership tolerated relentless attacks on the leading agencies supporting cultural pluralism in the not-for-profit sector — beginning with their own National Endowments for the Arts and Humanities. (With some irony, we now recall that those attacks were led by our own homegrown religious fundamentalists.) One effect of the attacks has been to elevate the U.S. commercial arts at the expense of the not-for-profit arts. The distinction between the two sectors is significant because, devoid of its not-for-profit competition, the impact of U.S. commercial culture in this moment of globalization has become overwhelming. Imagine how the U.S. looks to hundreds of millions of people around the world whose only sources of information about us are television, Hollywood movies and pop music. Equally troubling, at home this commercial preference has corrupted our own not-for-profit sector’s core values. For example, the standard production model in the not-for-profit theater is now the assembly line: the various "parts" (mostly people in the case of the performing arts) are brought from various locales to a central location (the theater) where they are assembled in a three- or four-week period into a final product. The play’s director interprets the production blueprint; the resident artistic director provides quality control. The product is then sold to arts consumers until market demand flags, at which time the production disassembles itself in a process akin to implosion. 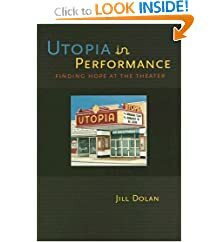 No wonder the not-for-profit theater refers to itself in aggregate as the theater industry, and no wonder that the commercial and not-for-profit resident theater audiences are essentially the same when measured by income: overwhelmingly the wealthiest 15 percent of the people (according to the League of American Theaters and Producers). As a rule, both the commercial and the not-for-profit arts sectors have come to value efficiency over participation, mobility over attachment to place, and short-term gain over sustainability." Yes, it does sound an awful lot like what Mike Daisey has been saying. Of course, Cocke said it in Kentucky and Daisey said it in New York, so Cocke was ignored and Daisey was hailed as a provocateur. "The nation’s diversity is its renewable source of energy, lighting the beacon of freedom that the rest of the world strains to see. It is now clearly in our national interest for the Bush administration to end cultural isolationism and replace it with a policy that secures the role of the not-for-profit arts in international exchange — and links that exchange to a domestic arts policy that values our own national diversity. In this way, we can create the framework for the arts at home and abroad to develop common goals." Why yes, that does sound an awful lot like part of the Obama arts policy! Cocke was way ahead of his time. And/or the theatre was way behind its time. Over at Flyover, there is a great article from the Charleston City Paper entitled "The Partisan Imagination: Does Being an Artist Make You a Liberal?" What I appreciate most about the article, in addition to its quoting from Martha Nussbaums' inspiring book Cultivating Humanity, is that it at least somewhat respects the complexity of the question. It doesn't answer yes or no, either-or, but rather maybe-and. he author weighs different viewpoints, and gives credence to those ideas that resist the desire to simplify the issue to melodramatic poles. The last line points to another facet of the subject, another viewpoint yet to be considered. Would there were more such thoughtful articles in newspapers or here in the theatrosphere. Much of my dissertation involved studying the writings of Lionel Trilling, an important literary critic who wrote for The Partisan Review from the 1930s through the 1960s. It is from him that I learned to appreciate complexity. Complexity does not mean obscurity, but rather an appreciation of the fact that most questions worth discussing are multi-faceted. Our society has become addicted to simple-minded melodrama. From our entertainment to our political discourse, we regularly choose the extreme over the measured, the fight over the discussion, the war over diplomacy. Throughout the presidential campaign, the media continually cried out that it was necessary for Obama to take a few swings at McCain, to deliver a "knockout punch," to get more aggressive. To his credit, Obama resisted those calls, because his vision for America is based not only on bi-partisanship, but on a recognition that issues are complex, and demand a thoughtful, measured process and response. Even now, as Obama prepares his transition to the Presidency, websites like Daily Kos (which I read compulsively throughout the campaign) is claiming that it wasn't Obama's stated values that won the campaign, but rather the Kossacks who went after McCain and Palin whenever they threw garbage his way. Perhaps they are right. Perhaps it is as Wallace Shawn said in Aunt Dan and Lemon, that our kindness and empathy relies on someone like Henry Kissinger to do the dirty work for us. But now that the challenger has been vanquished, it is time to put aside our weapons and help Obama in his attempt to create a different society, one that focuses on points of commonality not points of conflict, one that focuses on civil dialogue not polarized shouting matches, one that recognizes complexity rather than pretends to a simplicity that doesn't exist. This requires restraint. It requires us to give up the buzz afforded by killing dragons. For there are very few dragons, but there are many, many complex problems that require the insights and considerations of multiple perspectives. I am a lifelong Democrat, and during my 32 years of voting I have seen my candidates win and I've seen them lose. But never have I felt such a sense of personal hope as when Obama won. And that hope is based not just in a changing of the guard, an unseating of the Republican leadership that has taken us down so many despicable pathways -- I would not have felt the same way had Hilary Clinton been elected instead of Obama, although I would have felt some measure of relief nonetheless. Rather, the intensity of my hope, which seems to be shared by so many people worldwide, is based on something in Obama's character, something is his way of being, something in his grace, his civility, his discipline, his passionate open-mindedness. The President can set a tone, can call on our better angels, can remind us of what we are in our best moments rather than our worst. And he does that not only by what he does, but just as importantly by how he does it. As a society, we are hooked on the political crack that is partisan conflict. It is my fervent hope that Obama can take us through rehab, break our adrenaline addiction, and restore us to calm, thoughtful, civil thinking and discourse. Tom Loughlin posts a warning for all of us who might be inclined to turn Barack Obama's much-appreciated election into a cudgel with which to beat (or drum out) alternative viewpoints. Tom describes the arrival on his campus of a preacher who preached conservative, anti-gay sermon, and how many of his students and faculty felt it was acceptable to take action to drown out his speech. Like Tom, I have had such preachers on my campus as well, and like Tom I have defended the right to voice ideas that I find despicable and wrong-headed. What goes around comes around, and if we feel the right to silence others with whom we disagree, we should not be surprised to find ourselves silenced when the ideological worm turns. Isaac gets upset at Tom's post, because Tom presents no evidence that this is more than an isolated incident. I don't think that was the point of Tom's post. The point was to sound a warning. As someone who has spent the past twenty years on college campuses, I have seen the intolerance of the left firsthand, and it is very unsettling. Tom rightly points out that what made Obama such an inspiring candidate was his insistence that his campaign maintain at all times a civil demeanor. His election night speech, as Tom also points out, was focused on the same theme of one America working together. Democracy demands diversity, and that means accepting that there are people in the world whose opinions are objectionable. But a society unable to openly and respectfully engage all viewpoints, a society that swings wildly from pole to pole as ideological winds shift, is a society that has lost its mind, its heart, and its sense of community. I am old enough to remember when the Nazis wanted to march in Skokie Illinois. As the cover of the book When the Nazis Came to Skokie describes: "In the Chicago suburb of Skokie, one out of every six Jewish citizens in the late 1970s was a survivor--or was directly related to a survivor--of the Holocaust. These victims of terror had resettled in America expecting to lead peaceful lives free from persecution. But their safe haven was shattered when a neo-Nazi group announced its intention to parade there in 1977....The debate was clear-cut: American Nazis claimed the right of free speech while their Jewish "targets" claimed the right to live without intimidation. The town, arguing that the march would assault the sensibilities of its citizens and spark violence, managed to win a court injunction against the marchers. In response, the American Civil Liberties Union took the case and successfully defended the Nazis' right to free speech." The book description concludes: "Forcefully argued, Strum's book shows that freedom of speech must be defended even when the beneficiaries of that defense are far from admirable individuals. It raises both constitutional and moral issues critical to our understanding of free speech and carries important lessons for current controversies over hate speech on college campuses, inviting readers to think more carefully about what the First Amendment really means." We need to reclaim the basic understanding of democracy's foundational ideas, especially the idea of civic discourse and the importance of dialogue. If anyone should understand that necessity, it should be theatre people, whose very art form lives and dies on dialogic conflict between opposing viewpoints, from which comes a rich and complex synthesis. Thanks, Tom, for the warning.